Find iTunes Purchases in the iTunes Store? Every so often I get an email receipt from the iTunes Store that indicates that I’ve been charged a few dollars, but I don’t know for what. How do I get more details on my transactions? I live an even riskier life than you do, actually, because I have my credit card connected not just to my iTunes account, but those of my son and daughter too. Which means that, yes, every so often I see a transaction for a dollar or two and know it’s from one of them, not me. What did they get? What did they buy? 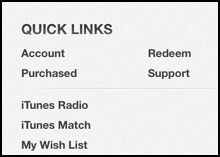 To figure it out, you need to be in the iTunes Store, which is most easily done in the iTunes app itself. Now I’m not necessarily recommending that you have your kids hooked up with your own credit card, but however you have things organized, it is darn helpful to be able to see the details. And if tehre’s a problem? I’ll show you how you can report a bad transaction too. To start, as I said, jump into iTunes. I’ll use iTunes 11 for these examples. As you can see, my most recent purchase is from about a week prior to writing this article. It’s worth noting that even free downloads are tracked and logged, so if you kids are thinking your parents won’t know about those questionable programs you added to your iPod Touch, well, you’re wrong. Something wrong? Or got a dog of a program? Or even found yourself charged for something that was supposed to be free? In all cases, click on “Report a Problem” to proceed. 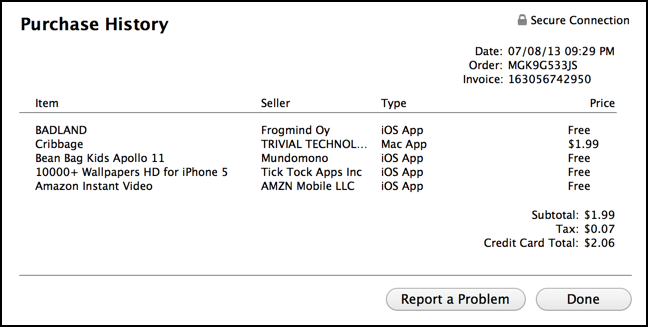 And otherwise you can now see the steps required to find and analyze your own transaction history in the iTunes Store.